Your family is sure to love tasty classics like Eggplant Parmesan, Supreme Pizza Casserole and Famous White Mac & Cheese. There's even potluck-sized recipes like Hearty Breakfast Casserole, Baked Chicken Jambalaya and Cabbage Roll Casserole. All are sure to be a hit at your next get-together! And with each recipe there's a beautiful, full-color photo to get your taste buds tingling. 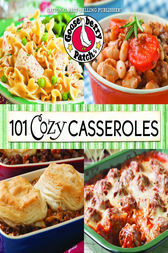 101 Cozy Casseroles is sure to become an instant favorite that you'll revisit time and time again.